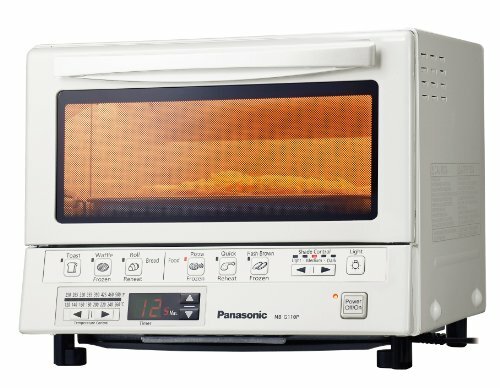 The Panasonic NB-G110PW (the white model of NB-G110P) Flash Xpress Toaster Oven is a toaster oven with top quality, and is one of the highest rated small sized toaster ovens in the market. It is fairly small and fits in any kitchen countertop nicely. It has a vast array of extraordinary features, but what sets it apart is its infrared cooking technology, which is efficiently implemented in this appliance. Users of this oven swear by its quality, durability and excellent results. A simple yet ingenious feature, this oven uses infrared halogen bulbs for even and thorough heating. It comes with double infrared cooking, near and far, thus ensuring both the outside and inside parts of food sufficiently heated. This oven also comes with a pre-set of several cooking modes, such as toast, pizza, and roll. It also calculates the cooking time required for each mode. This is a handy feature, and prevents the user from overheating or burning the food. It is easy to clean since the crumb tray comes out easily from the bottom of the oven. It has a bright interior light so that the user can see the food clearly while it is being cooked. In this way users can make adjustments to the settings based on what they see inside the oven. It has a small size and is therefore ideal for small kitchens. What Do Customers Say About the Panasonic Flash Xpress Toaster Oven? The most obvious advantage praised by customers this toaster oven has over other similar products is its infrared technology. In simple words, infrared technology dispenses with the need to preheat. Instead, it makes what you put in the oven get instantly heated, and it cooks both the outside and the inside of the food efficiently and completely with the near and far infrared heating. As far as I know, customers are very pleased with the results of this technology, reporting that it does what it promises, and food is cooked very evenly. It is especially good at baking frozen food such as garlic bread, with the center being very soft. Also, infrared cooking drastically reduces cooking time, which is a major positive factor of this oven. It is important to know that unlike ultraviolet rays, infrared rays do not affect health and are therefore safe to use in ovens. Customers also say that this oven has excellent performance in making soggy food delicious again, and is able to return the crispness and fresh taste to heated food with microwave oven. Infrared technology also makes it much faster than other competitors on the market, and therefore a much more energy efficient appliance. Its cooking speed adds bonus points for this product when it comes to preparing breakfast in the morning when you are running late. Also, it is surprisingly durable and is capable of bearing quite a beating. Users who have mishandled it by mistake have found that its tough exterior and high quality structure are worthy of the name. When it comes to appliances that can be part of your kitchen for a very long time, this product can do this job. Most users find that it works very well for at least six to eight years. It is easy to clean with the crumb tray which slides out so that crumbs are removed without having to shake them off the oven. Another added value is the bright interior light that indicates cooking. Most customers consider the interior light as an important factor when choosing toaster ovens. It enables the user to see the food clearly when working so that users can judge the process, for example, whether a bagel has achieved the perfect level of toasting. This oven also produces considerably less heat than its traditional oven counterpart. Considering the fact that it is designed primarily for small households, this is an essential feature to achieve comfortable cooking because no one wants a heated living space every time they operate their oven. It also reduces the risk of fire. Besides, it is energy efficient and does not put a huge number on your electricity bill. It has no hot coils, so it is safer than ovens that use this feature. First, this oven may not be suitable for people who want to bake large things in it. It is a small capacity appliance and cannot replace traditional ovens in terms of cooking capacity. Although it is great for toasting and baking small pizzas and slices, it is not possible to cook a chicken in it or bake a full sized cake. If you are searching in the market for an oven that can do these things (and you have the space for it), you’d better search for a oven with larger size. There is a learning process that users must go through when they first start using this product. The infrared heating technology, for all its advantages, is different from conventional heating technology and therefore optimal cooking times and settings are different too. What confuse customers is that recipes and instructions often include how long food should be cooked in the oven; however these instructions cannot be strictly followed when using this appliance. The user has to develop a feel for the oven’s cooking time, and experience some failure and trial. Fortunately, this is not a big problem, since customers have reported that they tend to learn the oven’s cooking time specifications fairly easily, and are able to operate it efficiently. Although a majority of customers have found it to be durable, some have found that the steam from the vents damages the paint after a few years of heavy daily use. However there is no indication that this affects the oven performance. Customers say that you should take care when placing the oven, since it has multiple air vents and none should be blocked. Also, unlike other ovens, the plug is placed on the right side and not at the back of the oven. Knowing this small detail will help prospective buyers better decide where to place the oven in their home. Pressing the buttons to navigate through settings will result in beep sounds, which some people may find irritating. Some users have also reported that the top of the oven gets very hot when it is under operation, and you must take care so as not to place anything on top of the appliance. Some people have noticed that it is a bit biased towards its backside, this makes the color on the toast bottom is slightly different from the top. This may not be a noticeable problem to many people. Some customers are confused with the differences between NB-G110PW and NB-G110P. Actually, there is no difference between them except the color. NB-G110PW is just the new white version of NB-G110P. The functions of both models are the same and some customers loves the housing of NB-G110PW because they think it looks much more fashionable. If you’re looking for a toaster oven that heats food very well, and is capable of baking good quality food in smaller portions, this is definitely what you want. It adheres to Panasonic’s reputation of providing quality products, and has features both in design and functionality that have made this oven a favorite of thousands of people who have used it. However, for someone whose cooking needs require a larger oven, this is not an ideal appliance. For everyone else, it is an easy and worthy choice.